Water inundates a Houston neighborhood after Hurricane Harvey in August 2017. A UMD researcher is a co-author on the first nationwide study of urban flooding. 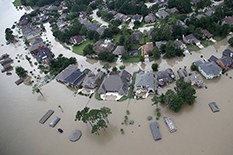 Flooding from an increasing number of intense rainfall events is a nationwide challenge that creates economic loss, social disruption and housing inequality, says a new report from the University of Maryland and Texas A&M University. The first to assess the national scope and consequences of urban flooding, the report calls on the administration and Congress to bring together state, municipal and tribal governments, nongovernmental organizations, and the public to define responsibilities and implement a variety of actions at the local level. That's one of nine recommendations presented in the report, released yesterday, to help governments at all levels cope with the growing threat. "This report affirms that communities across the country are in fact facing similar—and escalating—challenges, and that the principal responsibility for addressing the issue rests with local governments where their unique issues can be addressed," said Gerry Galloway, Glenn L. Martin Institute Professor of Engineering with UMD's Center for Disaster Resilience, and one of the primary researchers on the report. Urban flooding occurs when rainfall runoff exceeds what landscapes can absorb or drainage systems can move. As communities build more roads, structures and other impervious surfaces, their drainage systems—which often are aging, undersized and difficult to maintain—reach capacity faster, leaving flood waters to devastate homes and businesses. "The frequency of these events erodes the economic stability, health, and safety of a community over time. And the impacts can be felt miles from a stream channel or water body," said Sam Brody, director of the Center for Texas Beaches and Shores. To characterize the extent and impacts of urban flooding in the United States, he and Galloway surveyed stormwater and floodplain managers with knowledge of more than 350 communities in 48 states. They supplemented the survey through discussions with government agency and professional organization focus groups. The research team confirmed the survey responses with a detailed spatial analysis of federal flood-related data and information collected by state and nonprofit groups. While no single agency tracks urban flooding directly, the team found over 3,600 events in the National Oceanic and Atmospheric Administration's flood loss database from 1993 to 2017. The team also discovered that over 25 percent of National Flood Insurance Program claims filed from 1972-2014 were submitted for properties outside the 100-year flood zone. Overall, the results suggest the much of the damage incurred over the last several decades was caused by overwhelmed drainage systems and the alteration of natural drainage patterns through development. Despite the growing threat, Brody, Galloway, and their collaborators report that many municipal governments have been unable to dedicate the resources needed to mitigate urban flooding. At the federal level, no single agency is responsible for overseeing or supporting local activities. "Management and oversight activities related to urban flooding are scattered throughout governance levels and agencies," Galloway said. "This creates overlaps in responsibility in some cases, gaps in others, and generally curbs progress toward effective management." To move the policy needle on urban flooding mitigation, the report team recommends that governors, tribal leaders, and regional and municipal officials review oversight responsibilities in their jurisdictions as well as the provisions for flood water, wastewater and stormwater management. They also urge states to integrate urban flood risk communication, mapping, and disclosure measures into real estate transactions. In addition, the administration and federal legislators should take steps to support local efforts—for instance, establishing a risk administration grant program, and by creating a federal agency to provide oversite while the national stakeholders forum is established, the report said. "And at every level of government, officials need to take steps to ensure that efforts to combat the impacts of urban flooding reaches the communities and neighborhoods at the highest risk, regardless of their socioeconomic or geographic characteristics," Brody said.